This is a good Pharmacy project report on an investigation of modern ophthalmic drug delivery systems and was submitted in partial fulfillment of the degree of Bachelor of Pharmacy (Honors). Ophthalmic drug delivery is one of the most interesting and challenging endeavors facing the pharmaceutical scientist. 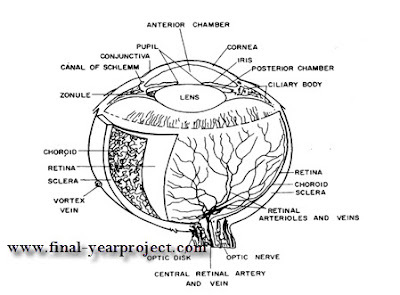 The anatomy, physiology, and biochemistry of the eye render this organ exquisitely impervious to foreign substances. The challenge to the formulator is to circumvent the protective barriers of the eye without causing permanent tissue damage. You can also Subscribe to FINAL YEAR PROJECT'S by Email for more such projects and seminar. The goal of pharmacotherapeutics is to affect a disease state in a consistent and predictable fashion. An assumption is made that a correlation exists between the concentration of a drug at its intended site of action and the resulting pharmacological effect. The specific aim of designing a therapeutic system is to achieve the optimal concentration of a drug entity at the active site for the appropriate duration.